Sales tax may apply when shipping to: CA*(8.25%), IA*, MN*, OK*(7.5%), PA*(8.0%), WA*. A + Perfect thank you. Excellent, good price and quality. super fast service great price, very honest people to buy from. Atomic Beam die... Trying another brand much cheaper. Ultrafire is surprising well made, almost as well as the Atomic Beam save that one died on me and it didn't even take a tank to run it over. Just a power button that came loose and pushed into the flashlight instead of turning it on or off. 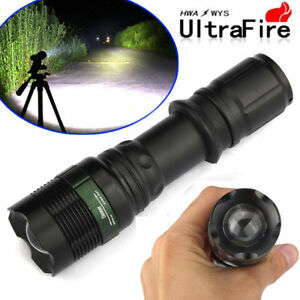 Maybe I just got unlucky but it failed me once so lets try another cheaper brand... Ultrafire feels like it would take a tank too save for that twist dial for focusing the light. My only pause is it's got the exact same power button on it too. Time will tell if this one fails in the exact same way too or maybe I just got unlucky. Second note... it is bright but doesn't seem as bright as the Atomic one but it's a minor setback as Ultrafire is also four times cheaper. For something that comes close to the Atomic Beam I have no grounds to really complain as I'm actually surprised how well it's been crafted. I got it cheap and received something better than what I was really expecting. I was slightly impressed by this light when it arrived. It was bright. I would estimate, by comparison with other lights from trusted sources, that the main light had about 500 lumens, the side lights were reach probably about 100 lumens, so a respectable 700 linens total. The light design was cool, with the ability to sun the outer lights downward to see the ground below. However, upon receiving the light, charging the batteries, and testing it out, I decided to leave it on to see how long it would last. About 10 minutes in, the centre light turned off. There was a tell tale smell. The outer lights stayed on. I opened the back of the light housing ( a very flimsy plastic cap.) And found the control circuit board with a burned transistor. So the light survived a total life of 10 minutes. Silver lining of that I will keep it. I can use the batteries and the car charger that came with it for my other flashlights. It was cheap. So no big loss. Still disappointing though. Please remember what you are paying for this light and the purpose you are getting it in the first place. I like this light. It has some drawbacks but nothing that would prevent me from seriously considering getting another one. It is bright and it has a fairly decent zoom. If you like star gazing and pointing at different stars this light does a good job when you use the zoom. I haven't treated it too badly but it seems study enough considering its cost. What is a little annoying is that it has a ring just around the beam like a halo, especially when you zoom. This is not much of an issue outdoors but indoors I found it a little distracting. I got the light primarily for outdoor use so its fine by me. If someone plans to use the zoom indoors a lot it might not be as nice. The other thing is that it uses special batteries so be sure to order some if you don't have any. I already had a headlamp that I use to recharge them in so that's another consideration before you purchase this light. Overall a very good flashlight. Goes through a battery fast, but as expected with its high intensity output. I find it is just as, if not brighter than the headlight of a car. I always carry it on me at all times and have had good luck so far with it holding up to my busy lifestyle. I have had it 3 weeks and haven't noticed anything coming apart or wearing out. I am looking at buying more now that I have had time to test its durability and functionality. I bought a few years ago and they're my favorite all-around flashlight. It says it takes a 3.7v batt but imo it works better with 1.5v, but you be the judge on it's brightness vs batt life. The drawback with this one, unlike mine which I'd give 5-stars, is it has that BS new three mode switch; low, high and strobe. Wtf!! !, at least give us the option to buy a normal on/off or convert this one. This is a DEAL BREAKER for me! I don't want to have to cycle thru to get the normal high setting every frikking time I want light, I just want light! So now I have the original and several 3-mode which I've given away to friends because I can't stand it. They also hate the 3-way deal so they're rarely if ever used. It seems all the cheap chinese flashlights these days have that function, so wake up mfgs and make normal switches or the option to disable it so people can actually be happy with their purchase.